www.aluga-algarve.com holiday rentals in Algarve made easy. The increasing number of properties to rent, villas and apartments, makes this website the most well known holiday rentals portal of the Algarve region. Enjoy sunny and relaxing holidays easily and at the best rates. 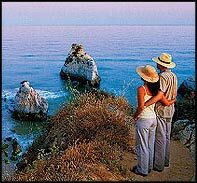 The deep blue sea, the gold sand, the sunny beaches, the warm weather, the cosmopolitan athmosfere of this region, makes Algarve one of Europe's favourite holiday destinations. Never lose sight of such a place! "A warm breeze walks through the waves, refreshing the golden sands, waiting to tell your story, stories of your presence here..."
The Algarve is known for its cosmopolitan nightlife with many bars and clubs. The many waterside restaurants serving fresh fish and "cataplana" (a local shellfish speciality) will fill your holidays with memories of delicious tastes - baked sardines, white bean soup, sweet potatoe, lingueirão rice - to mention a few.